I know Christmas is over, but I just can't seem to kick the Christmas spirit entirely. Each Christmas I like to give a little homemade gift to friends and neighbors along with my family Christmas Card. Last Christmas I made chocolate-dipped pretzels for neighbors and friends. They took forever, were really messy, and frankly, I'm sure most of them ended up in the trash since everyone gets so overloaded with treats during the Holidays! The Christmas before last I made mini banana bread loaves, and those were equally as much hassle. Farkle is a favorite family game of ours. It's simple to play, you only need 6 dice and paper to keep score, all ages can play, anywhere from 2 people to a huge group can play, and it's really really fun! 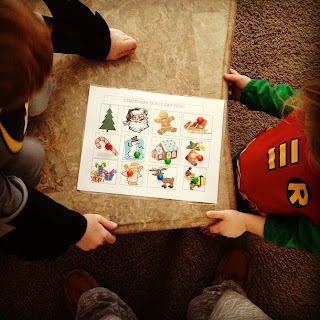 Last year I got this little travel Farkle game in my stocking from my mom. We use it on every trip, and seems like we use it at every friend gathering. So much more convenient than a huge traditional box game! So…I decided to make my own. I went to Ebay.com and ordered 400 dice (there was an option for 200 but the 400 box wasn't that much more…so I figured I'd use the extras for a travel Yahzee game for next year! *spoiler alert* :)). I liked the multi colors. I went to the web and found some Farkle instructions that I liked. I printed them off 4 to a page, and put them my inevitable empty baby jars that I have a bazillion of and use for everything. I glued some ribbon around the baby jar lid to hide the brand and make it a little cuter, folded the instructions and put them inside along with the note, and voila! One thing that impressed me this year is that I wasn't the only one trying to think outside the box in terms of doing creative, non-baked neighbor gifts this year. We were blown away by the cute, creative gifts we got! A jar of homemade salsa and bag of tortilla chips. A box of pasta with the note, “We hope your New Year is filled with endless PASTAbilities”. An adorable, small ceramic Santa candy jar filled with red and green M&M's. A home-made CD of their family's favorite Christmas songs. A 2-liter of Sprite with a ribbon around it, with the note “May your days be merry and SPRITE”. Reusable canvas shopping bag with our family's monogram stenciled on it. My friend Lauralee shared this cute idea with me. Her neighbor printed off special Christmas “Don't Eat Pete” game pages, and her boys LOVED it! Those were just a FEW of the fun, creative things we got! What did YOU give/get this year? Boot camp is coming! Our tickets sold out, but we were able to find a larger location and were able to increase the capacity…so nab the extra tickets while you can! Oh, happy day…Frugality Boot Camp Ticket Giveaway!! GENIUS!!!!! We love Farkle. Never thought of printing the instructions and gifting it. How fun! This year I gave stovetop potpourri, and rolo 'snowmen' for the kids' teacher's aides. I agree with the no-treat-or-food idea of gifting. I did truffles one year and spent HOURS upon HOURS on them! Yeah, I love my neighbors, but really? Not THAT much! hehehe Is that mean?! I love this idea and this game! I may have to save some baby jars for next year. 😉 I am on the same page about the no treats gift, there are just too many! I made homemade vanilla and it was a hit! It have to brew for 6 months, so I started it in June, but it was totally worth it. I just started reading your blog recently and I love it! I'm going to sign up for Deals 2 Meals soon, because I am no couponer, but I think I can take on price matching. Thank you for all your tips!. Do you happen to have the link to the Farkle instructions you used?? I can't find any that look as authentic as yours!! So impressed about the Vanilla! What a fun project. You'll love D2M, it's changed my life. Keep up the good work! Love these ideas! And I the added personal touch is so nice. I posted a few other inexpensive, DIY gift ideas around the holidays – check them out if you're interested! Thanks for sharing!! I am totally doing this for my neighbors this year so thanks for the great idea!! I can’t stand throwing away jars from Trader Joe’s so I have several that I am going to recycle to use for these gifts. Thanks!! I’m glad you like it, I’d love to see how yours turns out! Send over a pic when you’re done! Hi Jordan! I totally made these Farkle games this year in Mason Jars for my coworkers and they were a huge hit! Total cost per jar/game- $1.30 😀 Thank you again for everything that you do! I’m so glad!! I bet people loved them 🙂 Thanks for sharing! I love this idea! I can’t seem to find the game instructions. I’d love to use this for my neighborhood gifts this year. Do you by chance have a PDF that you can email me? I am also in search of the farkle instructions. I haven’t been able to find them at that link either. Could you email the pdf to me as well? Thanks! YES! Thank you so much! Can’t wait to hand these out as neighbor gifts. Dice is ordered and on its way. Thanks so much for the great idea. above but it just goes to a game website. Help! Just thought I would mention that this is illegal— the game and the instructions have a copyright. Hate to be the scrooge but the reason for the copyright is to protect everyone!!! How did you get the instructions to print 4 to a page? I’ve never heard of this game but what a creative idea! Your right people get overloaded with sweets at Christmas so I can see why this was a hit!